We're reporting a series of stories on renewable energy in Texas, how East Texas benefits, and what Tyler residents and businesses can do to make the switch (and even make a profit). When we asked Tyler residents what they’d like to better understand about our city, several of you had questions about how East Texas will be affected by climate change, and how Tyler residents can get involved in preserving our local environment. Today, we’re explaining how Texas has become a national leader in renewable energy, with wind power generated in the plains of West Texas powering homes and businesses right here in Tyler every day. How does that power get to East Texas? How did Texas become a leading player on the sustainable energy scene, and is this a partisan issue? Could wind and solar ever become Texas’s main suppliers of power? Those are some of the questions we’re digging into today. Later in this series, we’ll take a close look at renewable energy options in East Texas. We’ll also explain how Tyler residents and businesses can make the switch, and potentially save (or even earn) money along the way. Jump to a section you’re interested in below, or just start reading! How did Texas become a national leader in renewable energy? Is renewable energy in Texas a “liberal” issue? Don’t most Texans believe climate change isn’t real? How does wind power from West Texas reach us all the way out here in Tyler? Could Texas ever be powered entirely by wind and solar? What’s all this about Texas being a national leader in renewable energy? Last year, a big report from Environment America, a nonpartisan research center, ranked Texas first among all states in “clean energy progress” between 2007 and 2016. The report affirms what state and national headlines have been saying for years: Texas is a renewable energy powerhouse. Most of this boom comes from wind: in 2016, Texas produced a whopping 58,000 gigawatt hours of wind power generation, far more than any other state in the country. All that wattage packs a punch. “During the early morning hours on one day in February 2017, wind power supplied more than half of Texas’s electricity demand,” Environment America notes. It’s important to note that solar still plays a very small role in Texas’s energy landscape, accounting for just 1 percent of the state’s energy last year. Nonetheless, sunny Texas ranks 3rd in the country for predicted solar growth over the next five years. 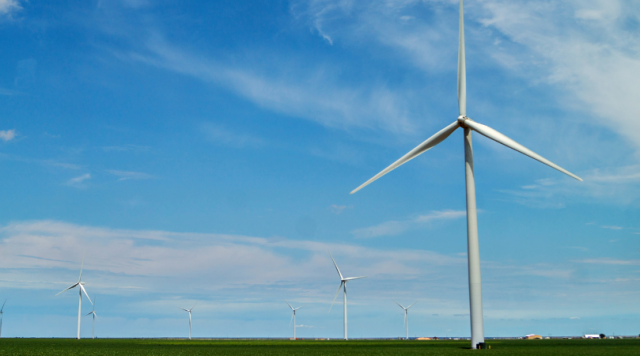 Republicans have been at the forefront of building Texas’s renewable capacity. In 1999, then-Texas governor George W. Bush signed a massive bill deregulating the state’s energy sector. It empowered individual consumers to decide who to buy their electricity from, instead of being forced to use options chosen by local officials. This means retail electricity providers like Champion and TXU Energy are motivated to keep costs low, which has spurred investment in new technology—including renewable energy. Today, there are over 12,000 wind turbines spinning in Texas. Republican governor Rick Perry, who took over in 2000, oversaw the deregulation that Bush signed into law. He also supported the Competitive Renewable Energy Zone, a $7 billion project that connects the windy plains of West Texas with places like Tyler through an electrical transmission grid stretching nearly 3,600 miles. Both Bush and Perry also supported increases in the state’s required renewable energy capacity. In 1999, Bush set a goal of of 5,000 megawatts from new renewable sources by 2015, and Perry expanded that goal slightly in 2005. Both goals were seen as relatively modest at the time, and the state blew past those benchmarks in short order. By 2017, Texas was capable of generating over 26,000 megawatts from new renewable sources. It’s also worth nothing that there has been bipartisan support across the state for moving further away from coal-fired power and toward renewables and natural gas. “Eighty-five percent of Texans (including 81 percent of Republicans) believe Texas should develop its own comprehensive clean energy plan,” according to a survey of 800 Texans developed by Republican pollsters. Don’t most Texans believe climate change isn’t real? Why is Texas bothering with renewable energy? Actually, according to a study by Yale University, most Texans—70 percent—believe climate change is happening. Only 14 percent are sure it’s not. A slight majority (56 percent) believes climate change is caused by human activities. Half of all Texans believe climate change is already harming people in the U.S., and more think it will harm Americans in the future. But here’s what’s really interesting: Texans don’t have to accept the scientific consensus on climate change to adapt their own behaviors in ways that make a difference. For instance, here’s the story of a large West Texas ranching operation that began working with a smaller breed of cow—one that requires less food (and therefore less water)—after climate-change-driven water shortages made it necessary to adapt its business. Meanwhile, farms and ranches across West Texas have erected wind turbines on their land over the last decade, sometimes seeing their acreage become profitable for the first time in a long time after doing so. In Comanche County, desperate peanut farmers who were suffering the loss of a federal subsidy banded together with local ranchers and convinced county officials and energy companies to support a huge new wind farm in the area. Today, cows, crops, and turbines generating enough annual power for 50,000 Texan homes share the same land. One energy company says the wind farm will bring $80 million to the county over the next 25 years. Nolan County, three hours west of Dallas, watched its tax base grow to nearly $3 billion dollars—a nearly eight-fold increase—in just seven years after building four of the largest wind farms in the world. Whether or not they accept the scientific consensus on climate change, when it comes to renewable energy, Texans across the political spectrum are seeing green. So how does wind power from West Texas reach us all the way out here in Tyler? Texas’s $7 billion, 3,600-mile wide electrical transmission grid is so effective that it’s seen as a model for other long-distance wind power efforts, like the Google-backed Atlantic Wind Connection, a plan to create offshore wind farms off the East Coast. How did Texas succeed when other states struggle? Planning. Texas adopted large renewable energy goals coupled with a plan to build transmission to serve the state’s wind energy rich zones. The best wind energy zones are in windy, but remote west Texas, and the power is needed a long way away in the cities of east Texas. At the time, the grid in west Texas was weak and no individual wind energy project developer could afford to build the transmission required to reach east Texas. And, even if they could afford it, there was little sense in building many small capacity circuits for multiple wind energy projects when fewer, high-capacity circuits could transmit the energy with greater efficiency, lower cost, and lower environmental impact. Responding to this need, the Public Utility Commission of Texas solicited proposals for high-capacity transmission lines that would connect several thousand megawatts across multiple west Texas wind farms. These high-capacity “backbone” circuits became the foundation that made it possible to efficiently develop Texas’ remote, clean wind energy resource. It’s really too soon to say. But this year, Texas energy production from wind is expected to overtake production from coal for the first time ever. And the state’s Electricity Reliability Council, which oversees Texas’s grid, recently showed that 85 percent of Texas’s future capacity—meaning new projects currently in the works—will come from wind and solar. Just 12 percent will come from gas, and zero percent will come from new coal projects. Oil and natural gas production surged in Texas during Perry’s tenure — by roughly 260 percent and 50 percent, respectively. Those booms poured billions of dollars into state coffers and helped lift Texas from the country’s last recession. The phenomenon, however, also stirred concerns about air and water quality and strained infrastructure in some regions, including roads and emergency response capabilities. What’s clear is that at the moment, Texas relies on a diversified slate of energy sources. The operator of the nonprofit organization that manages Texas’s electrical grid warned at the start of this summer that this year’s shutdowns of three coal power plants in Texas—which some have blamed on state subsidies for wind power—could lead to rolling blackouts as temperatures climbed. That didn’t happen, but it highlights the interdependence of our current energy mix. Well, all of this sounds great. How can I switch my home or business to renewable energy? Stay tuned for the rest of this series! In the meantime, have more questions about renewable energy in our state and region? Drop me a line.